There was a large flock of Sanderlings sleeping peacefully on a series of ledges along the jetty at the Barnegat Lighthouse. I saw a Sanderling being dislodged by a bigger Ruddy Turnstone, one among several which walked with impunity among the smaller birds, looking for food as usual. In any case, the following series of shots illustrate the Transition theme for this week’s challenge. 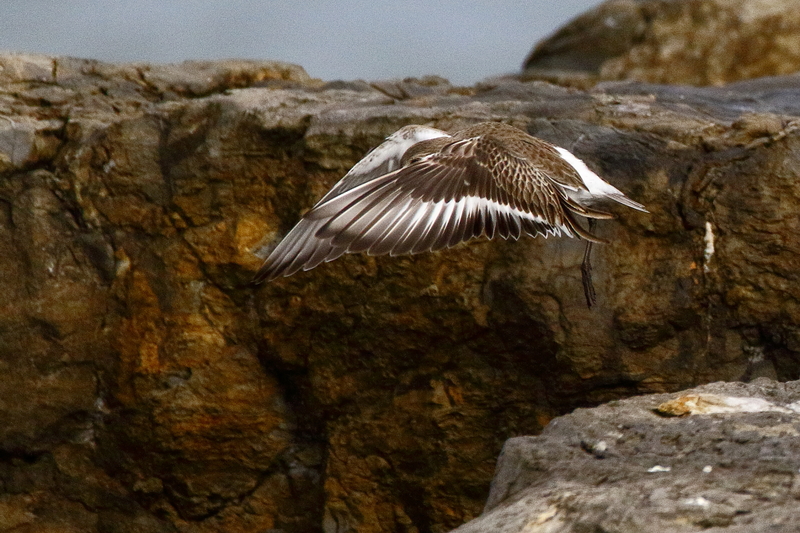 Sanderling pushed off ledge by Ruddy Turnstone (not shown). 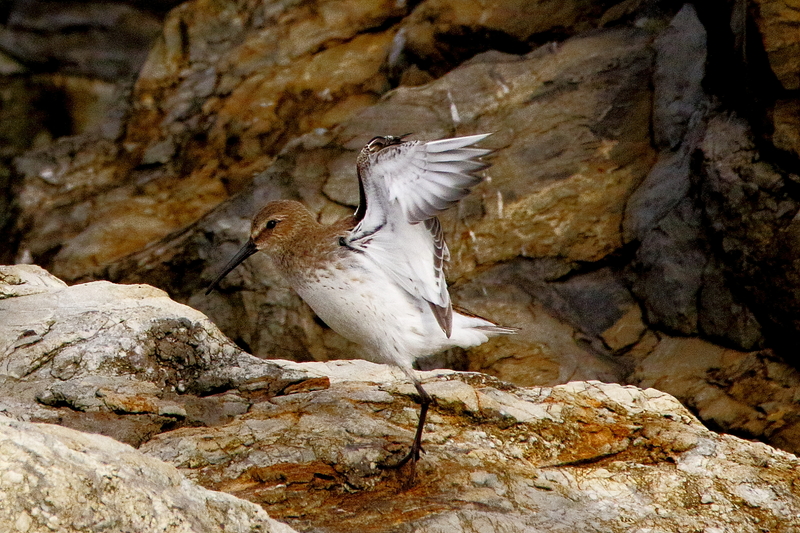 Sanderling landing on lower rock ledge. 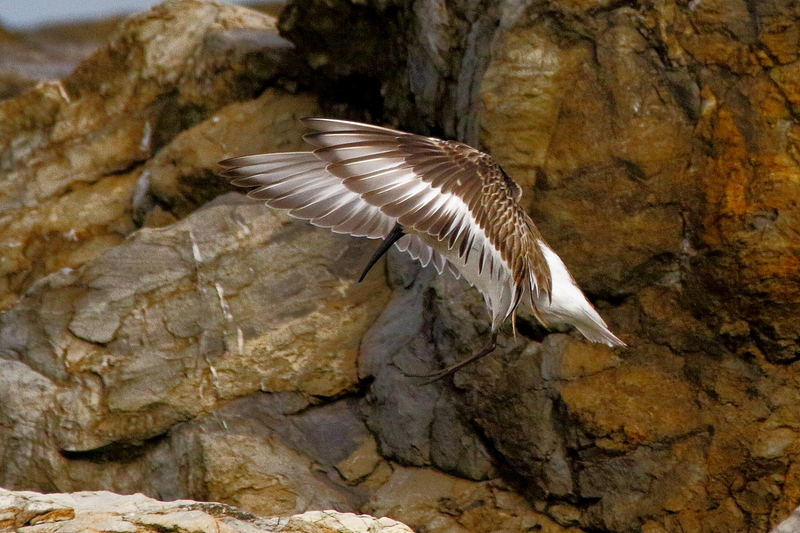 Sanderling coming to a stop and pulling wings in. Great photos no matter what the theme was! On a scale of 1-10, this is a 12! Wow, the background totally sets the stage for the beautiful spread feathers. Beautiful work ~ the second shot is fantastic, a blend of action but mostly the grace of feathers and the art of flying only a master of the sky can have. Thanks Randall! This all happened within a second or so, and I am fortunate to have my camera pointed at the right spot and the right time. I was actually following the Ruddy Turnstone, curious about how it moved around amid the Sanderlings. Thanks Nia! Glad you like the bird and its photos. These are such dramatic and powerful shots. I love how defined the wings are displayed.